In an age where big studios dominate filmmaking, short films have become a means to bring experimental and adventurous work to the movie-goer, and no more so than at events like Rock’n’Roll Cinema. The evening of bands and short films, held at 93 Feet East in Brick Lane, is going into its fourth year – quite a grand old age for a monthly event, many of whose contemporaries have vanished without a trace. ‘It was born out of a combination of me being in a band and wanting new places to play, and of knowing different creative people who could come together to help me put on a night. I also found that when I went to the cinema I always wanted to talk about the film afterwards’, explains Dan Cundy, founder of the night. The different creative people include Dan’s girlfriend Wednesday, known as Rollergirl, who skates around singing jingles and selling popcorn, and the DJs, VJs and compÃ­Â¨res he chooses to pull together the night. One of the films specially picked for the Brick Lane crowd today is Fitness Video by Japanese director Nagi Noda. A surreal spoof exercise routine led by a young girl with Popeye-style muscles backed by a chorus of bipedal poodles, it is lapped up by the audience. You can tell when the audience likes a film because the laughs are louder and longer than those usually heard in a cinema. The same goes for the gasps, and even the awestruck silences seem more silent. ‘I think people are more relaxed here because they can walk around. It might mean that they’re less absorbed in the films because they’re right next to a bar but you get a better reaction from them as they’re having a laugh with their mates’, says Pippa. The loudest gasps come during the opening film Spider, an Australian film directed by former stuntman Nash Edgerton. Its slow build-up of tension and triple-shock ending show that with the right story and execution you can move the viewer more in eight minutes than some films manage in two hours. There may be speed-dating and cakes in the next room, a barbecue and bottle bar outside, and bands and hula-hooping to come, but while this film is playing all eyes are fully forward. 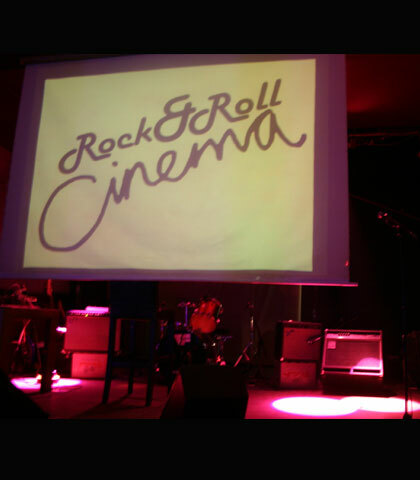 Rock’n’Roll Cinema takes place every first Sunday of the month at 93 Feet East, London. For more details visit the website.